Edit 11 June 2009: the Bath Chronicle has resolved this issue. Please see this post on the further reporting that has been done. They shouldn’t take the BNP’s ads, but how should papers report on the BNP? They’re a legal political entity (inexplicably, but there you are) and a matter of interest to your readership – both good arguments for publishing stories about them, and that’s before you get into the idea that it’s better to address their arguments publicly than drive them underground. So, let’s say you’re an editor with news items about the BNP’s council election campaigns and the controversy among the mainstream parties about how to engage in debate with a racist organisation. What are you going to do? Top story: “Mum, dad and son to stand for BNP”. 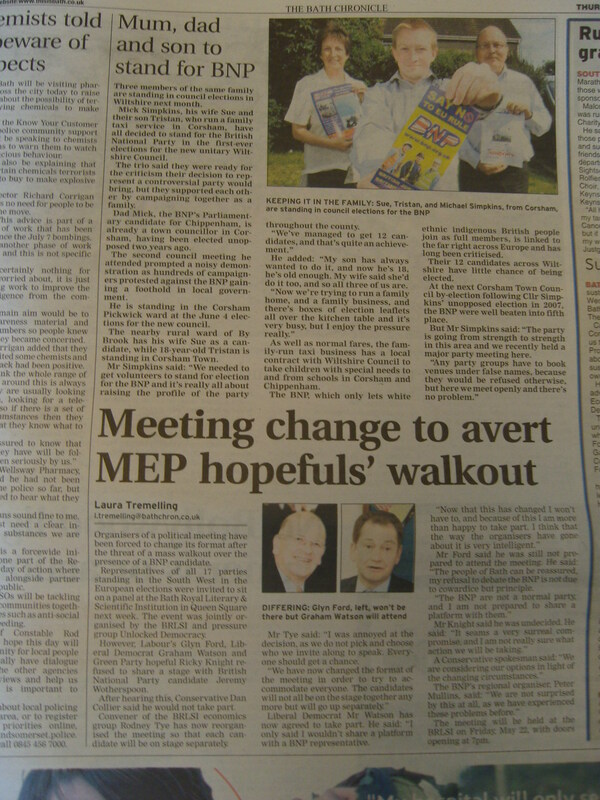 Bottom story: “Meeting change to avert MEP hopefuls’ walkout”. Not featured: any response to the BNP’s policies, although the top piece helpfully informs us that the party “only lets white ethnic indigenous people join” – a catagory so meaningless it’s surely come straight from the BNP handbook. From this page of newsprint, you’d get the impression that the BNP is some sort of loveable family concern squaring up to the grey suits of mainstream politics with a bit of underdog spirit. If you’re going to read about the repatriation policy or Nick Griffin’s criminal record, it won’t be in The Bath Chronicle. Sam Holliday, editor of the Chronicle (edit 11 June 2009 to remove email, as Sam has resolved this issue) has decided that his readers need to be informed about the jolly face of the BNP and not their despicable principles. The writer of the “Meeting change” story, Laura Tremelling (edit 20 May 2009: Laura would prefer that her email not appear here, although it is published in her byline in the paper) has spoken to representatives of Labour, the Tories, the Lib Dems and the Greens and either not questioned them – or not quoted them – on the specific reasons they refused to share a stage with a BNP candidate. That’s lousy journalism anyway, barely adequate to the coverage of a flower show. But when the subject is the BNP, it’s lousy, tacitly racist journalism. I don’t have a local paper anymore. Edit 20 May 2009 to clarify that Tremelling is only responsible for the “Meeting change” story. The family profile is uncredited. < Previous [Guardian Books Blog] Can the newspaper novel survive in the internet age? Great post. My husband works in local media, he reckons they are not allowed to say anything harsh about the BNP or they will get sued. So they are not allowed to call them racist, but do have to give them equal representation legally. So hopefully the paper doesn’t actually support them, but can’t think of any other way to cover it. Yes, but he’s talking rubbish. They can say anything about the BNP that isn’t false and defamatory, but they have no obligation to say anything about them at all. Every local paper could run the headline Don’t Vote For BNP Racists tomorrow, and that wouldn’t break any laws. Equal representation only applied to TV/Radio, as in ‘We asked for a statement, but they declined to comment’ way because it’s covered by OFCOM. Print media doesn’t have to, as they are covered by the Press Complaints Commission. Print media could completely ignore the BNP in any story about anything. That was my understanding, anyway. You’re correct: it’s terrible journalism. But then there’s little evidence that the Chron has been written by journalists for years. I wonder who planned the meeting for the opening night of the Festival? Not saying it’s a good story, I think they handled it really badly. Just that sometimes the press can’t say what they really think for fear of legal repercussions. The BNP have been known to make official complaints against newspapers that speak against them…. I don’t know all the rules that apply to the press, but I would hope that a local paper wouldn’t actively support something like that. I imagine that just the threat of bringing down the wrath of angry racists probably has a censoring effect – especially when money is tight, litigation expensive (even if you do win) and the lure of a prepackaged story strong. But this story is *so* soft it could have come straight from BNP campaign material. Even the laziest, most desperate-for-copy paper should be able to see that sympathetic reporting on the BNP is a bad thing to do. Ceedee, you’re right – it’s madness to have a major political meeting on a big civic night out. Hmm. You’re confusing two things watchdogs and the law, and political representation and right of reply. The PCC upholds a code of conduct, as does OFCOM. But the LAW applies to print, TV, internet, you name it. You could libel me by email. One of the important principles of media law is that you need to show you have acted responsibly. It’s known as the Reynold’s Defence. The point is that you have not exactly got an obligation to allow right of reply, but you should do so if you want to later claim you practised responsible journalism. It also makes it harder for the other party to dispute what you say if you’ve put it to them first and allowed them to respond. It’s a backside-covering exercise. So you don’t have to include the BNP in anything – but you have to do that “We asked for a statement” thing with print media too. No reply from the other parties concerned though – shameful reporting. Papers don’t have to do anything with them. They don’t *have* to take any political advertising and they don’t have *have* to run any stories about them. A post on Pickled Politics might be of interest to you, too. Thank you for your comments which I have decided to reply to directly as I take a complaint of this nature very seriously. First off, you accused us of ‘poor journalism’ and ‘sloppy work’ and yet you have wrongly credited this particular story to a journalist who didn’t even write it and then put her name on your blog for other people to presumably have a go at her even though she has nothing to do with it. She is understandably bemused. I would ask that you take her name off this piece – with immediate affect. That apart, I am more than prepared to discuss this serious issue with you and would stress straight away that I truly understand your concerns on this. I have my own very strong feelings about the BNP but as an editor my views are irrelevant as I have to, as you point out, act in a ‘fair, balanced and accurate way’. The BNP, whether we like them or not, are a legitimate, legal political party who are standing throughout the country in the forthcoming elections. To pretend they don’t exist would be neither ‘fair, balance or accurate’ and that must be fairly obvious to all our readers. As for this particular story, I can, again, understand why it made you angry but this was not a political story per se it was a family one. If three members of the Labour, Conservative, Lib Dem or Greens were standing in the same election it would be a story and that is the way we saw it. Are we to pretend the BNP doesn’t exist? You said the story was ‘sympathetic’ but if you read it in full you will see we refer to the controversy when the father of this family was elected as a councillor, talk about their ‘whites only’ selection policy and mentioned they were linked to the far right. You could argue (and the BNP would) that even these lines were too political in such a piece – would we have implied such criticisms of the family of members of other leading parties for example? However, I believe it is right to do this and probe a bit further when it comes to parties not so well known to the public. If you saw the paper in which this story originally featured you will have seen that on the same page our ‘lead’ story was about a meeting of potential candidates for the EU elections where the BNP had been invited along with other parties and many of the other parties refused to share a stage with them. The organiser of the event said he felt he couldn’t not invite the BNP if it was to be a proper debate for all the parties standing and was a bit confused by it all but hopefully this shows how difficult it is for all of us dealing with this particular party. Put simply – we are damned if we do and damned if we don’t. You will be as aware as anyone, I am sure, that the BNP make great stock of the fact that the ‘media’ is against them as we are part of the establishment. Should we play into their hands by ignoring them? You could also argue that the only way to truly debate (and win) an argument is to hear what your opponents say – to shut them up and shut them out is counter-productive. I can still recall when Mrs Thatcher banned Sinn Finn from being heard on the BBC and we had the farce of ‘actors’ speaking for Gerry Adams. Banning something does not make it go away – in some ways it can add a sense of dangerous underground kudos to an organisation. Sarah, I know how hard it is for you and others to see a party like the BNP sitting alongside Labour, Lib Dem and Tories but can we selectively ignore them? And, are you really happy with the idea of regional newspaper editors selectively banning coverage of parties they don’t like? If we did that then how long before a right wing editor refused to print stories about the Socialist Workers Party or Respect? Before long you would have Tory editors not printing Labour stories and vice-versa and the ‘fair, balanced an accurate’ coverage we agree all regional newspapers should have would have gone to hell in a handcart. If you want to have a go at the BNP then we have the medium for you to do – we have three very good anti-BNP letters in tomorrow’s Bath Chronicle for example with no right of reply – and I suspect the BNP will be angry about those. Should I ban those letters as well for raising the BNP profile? Of course not. I am not sure we will ever convince you we are right on this but we would just ask you to accept that this is not a simple an issue as just ‘banning’ a party and self-selecting censorship is a very dangerous route to take indeed. Thank-you for your response Sam. Firstly, Laura’s byline is on the second story in that spread, which I consider equally at fault in failing to address the relevant issues. I will edit the text to clarify that she wrote the second story and not the puff piece. Secondly, I am not asking you selectively ignore the BNP. I am suggesting that running a soft news, human interest story on BNP candidates which doesn’t tax them on the party’s policies and goes so far as to use BNP-sanctioned language (“white ethnic indigenous British”) suggests a very poor standard of journalism and a worrying level of sympathy for a party with racist policies. I hope you will write about all the parties you mention in an interrogative and challenging way, and not in the way you presented the family of BNP candidates. Agreed with Sarah…the tone of this piece is all wrong. You’d expect a “family of hate” style angle but not this. “In some ways it can add a sense of dangerous underground kudos to an organisation.” Indeed Sam, so far better to do an astonishingly fluffy family-themed piece of blah instead. You don’t have to ignore the BNP, but if you are going to cover them it absolutely has to be with some rigour as to what their policies are, and what they would mean for this community if they were to gain power. At no point did I think Sarah was suggesting that the Bath Chronicle (or anyone else!) ban coverage of the BNP or only cover the party in openly disapproving terms, and I agree that the best way to attempt to stop the success of a party such as the BNP is to discuss them, but you did not do that and to claim that this was a ‘family’ piece is disingenuous and absurd. Yes, it is a legal political party; so was the National Socialist German Workers’ Party. In the current climate this was an irresponsible and dangerous way to cover the actions of a party who are exploiting the fears and misfortunes of vulnerable people in order to gain votes. We cannot separate or compartmentalise elements of lives in such a naive way and say that the other parts are not relevant – in these difficult and precarious times it is the case more than at any other time since WW2, that the personal IS political. Perhaps Sam could link to the Chronicle stories examining the performance of local BNP councillors? I’m still bemused that Sam seems to believe that this “family” story is anything but a PR puff. Must be so tricky to spot them these days, eh Sam? Actually I can’t Ceedee because the councillor in question operates on a council (Wiltshire CC) not covered by the Chronicle. He does live in our ‘patch’ though – hence this story and indeed the big one we did on the mass protests when he first arrived on the council which could hardly be described as sympathetic. While we are on a questioning mode, Ceedee, perhaps you can explain what major stories we have actually missed that led to your comment ‘ there’s little evidence that the Chron has been written by journalists for years.’ If this is the case then the non-journalists who work here did very well to make sure the Chron was voted Newspaper of The Year THREE times last year. Apart from that, there is some very good points here though – and trust me we will take them on board. I found Annabel’s comments particularly challenging although I have to say quoting the Nazis example is a bit of a double-edged sword. Following the 1923 failed putsch, the German authorities trtied to ban the party, force it underground and imprison its leader. The rest as they say is history. The only thing I cannot let pass is Sarah’s comment…….’suggests a very poor standard of journalism and a worrying level of sympathy for a party with racist policies’. Attack my journalism yes but please never, ever suggest I or my paper have any ‘sympathy’ for racism or rascist policies. I abhor both. With a passion. I’m very glad to hear that you abhor racism. But if I google the phrase “white ethnic indigenous British people”, as used in the copy, the only sites you will find using it (or variants thereof) uncritically are the BNP and other groups with a racist platform. The Chronicle uses it in this article as though it’s a meaningful category, which suggests that text from BNP campaign material has slipped unchallenged into the paper and is presented in the reporter’s voice. So rather than being fair and balanced, the reporting accidentally endorses a BNP viewpoint. That’s not very classy, and as you abhor both racism and racist politics, I really hope you’ll add something to the style guide to eliminate direct uses of that phrase and others like it. Sam – credit for responding to the discussion. So why run such an uncritical piece? The sympathy isn’t suggested, it’s there, it’s manifest in the unquestioning choice of a family with extremist political views for a public interest story. I think you’ve answered your own question but, for clarity, I’ve not suggested you’ve missed any stories (tho’ I’m sure there must have been some) but that the level of journalistic ability has collapsed over the 25 years I’ve been reading it. While I’m about it, can I also suggest that your paper’s web presentation is pretty piss-poor too. I have to wonder how many people from Bath nominated the Chron for any Newspaper of the Year award – perhaps they were asked to “name the first local paper that came to mind”? Don’t you think it’s strange how few non-Northcliffe papers win that award? Sorry to be the bearer of bad news but if the current standards displayed by the Chronicle are the best you can do “with a passion,” then I’m afraid you’re failing. First off cedee please try to give us a bit of credit. You say: ‘I have to wonder how many people from Bath nominated the Chron for any Newspaper of the Year award – perhaps they were asked to “name the first local paper that came to mind”? These awards are chosen by independent media professionals from not just newspapers but other journalistic backgrounds who recognise the Chron for what it is – a genuinely strong and complete weekly newspaper. You say I am a failure in my job – and you have the right to say that – but how else can I be judged but by very good weekly sales, remarkable web figures on our supposedly p***poor site and a host of national awards. That kind of failure I can accept. Back to the point of the issue, tomorrow (Thursday) we have three letters knocking the BNP. Will I now be featured on a BNP site under the heading ‘My local paper’s anti-racist friends’? I will keep you posted. Sam, I don’t understand why you keep mentioning “banning” and “self-censoring” when no one here has suggested you do anything of the sort. The point is exercising editorial judgment. Ultimately you guide what slant is taken on stories in your paper. The issue is that you’ve chosen to publish what you describe as a family-themed piece rather than a political one, and the piece only skims lightly over the party’s openly racist policies. That’s not okay. It’s crucial, relevant information to your readers. You can see that surely? Also, the implied notion that newspapers can’t be seen to take a strong stance for/against particular parties is patently nonsense… Open any of the nationals up. Also, ask yourself whether *any* national would run a story alike this with so little censure in the copy. They aren’t a legitimate party. They’re dangerous extremists. That’s, y’know, why serving police officers aren’t allowed to be members. You’re confusing balance with accuracy. It’s easy to piss everyone off. It’s hard to give a correct account of the issues that affect your patch – but as a journalist, ideally you should be a bit more interested in reporting the truth (of, say, the BNP’s policies and ideology – which aren’t described in either of the stories on that page) than generating reactive debate. What you’re saying is that publishing those three letters gets you off the hook for running a story which presents the BNP in an uncritical light. Isn’t that just getting your readers to do your work for you? Besides, the paper’s voice always carries more weight than the guests you let in on the letters page. And you’ve used the paper’s voice here to promote a very unpleasant political organisation. I’ve not seen this much ‘stick and move’ since Ali was in his pomp. Nathan_Ditum makes a staggeringly obvious point, why the public interest story in the first place? Also, ‘we have three letters knocking the BNP’ suggests that because you’ve printed these comments from offended readers, you’ve somehow balanced this whole situation out. Or is this another ‘bob and weave’ to dodge the point here? As this is getting a bit personal, I guess it is fair to put my personal stamp on it. Before that, I am afraid Tim that although you make many fair points you are falling into the trap of equating local and national papers when it comes to political coverage. No local paper will ever support one party or another officially as we believe everyone has an equal right to local news. Nationals operate to totally separate rules. Back to that personal level, I would hope that the following peice I wrote last year in my by-lined column (the only area I can express a personal view) shows what I feek about racism. I have been interested in the Holocaust for many years and as well as visiting Auschwitz on my own for last year I have also visited Yad Vashem, the Jewish Holocaust memorial site in Jerusalem. I have seen where racism leads – and that is why I hate it. Usually I write this column from the comfort of my air-conditioned office in downtown Windsor Bridge. Today I am writing from a very different location, having just visited a place which is a million miles from our wonderful life here in Bath – Auschwitz. For, macabre as it may seem to some, today I fulfilled a long-held ambition to visit somewhere that might rightfully claim to be the most hated place on Earth. And it was every bit as moving and terrifying as I had ever imagined. I can still remember the first time I became interested and absorbed by the Second World War and the Holocaust. I was ill and off school at the age of about nine or 10 and in those prehistoric days the only TV programmes during the day tended to be school ones. On this day I happened to catch a programme about the Holocaust meant for older children. I sat there open-mouthed with my mind racing. How could rational, normal people treat others like that, I wondered? And what was so wrong with Jewish people that made Hitler and his vile regime want to wipe them off the face of the planet? For a nine-year-old it was baffling enough – but now as a 44-year-old I am no closer to an answer. However, I knew then, as I know now, the difference between good and evil – and today I truly looked evil in the eye. Nothing – not all the countless books, films and TV shows (fact and fiction) I had read on the subject – could truly have prepared me for Auschwitz. After all, when was the last time I was given a glimpse into Hell itself? Of course, I knew the facts and figures – more than 1.25 million people died in the places I visited today, of whom 90 per cent were Jewish. That is all truly extraordinary but what you don’t expect is how ordinary these killing factories are. Auschwitz 1 (the original camp) with its terrifyingly cruel slogan on the gate ‘Arbeit Macht Frei’ (the lie that ‘work brings you freedom’) looks like a collection of old school buildings – albeit ones with watchtowers and barbed wire. But inside those innocuous blocks are sights you will never see in any school unless Beelzebub is the headmaster. Our guides calmly took us through blocks where hundreds of thousands of unthreatening people perished, and other rooms full of items the Nazis had plundered from their victims. We looked on in horror as we saw pyramids of glasses, clothes, shoes, toiletries and a sea of suitcases. Apparently the Nazis, when fleeing the camps, destroyed the vast, vast majority of ‘evidence’ so the fact that, for instance, you still have to walk through a room the length of two tennis courts which is full of human hair speaks volumes. I am sure every person saw different things today that will live with them forever. We walked into and through the actual gas chambers, we looked inside the torture cells and we saw where the trains arrived at the perfectly ordered Auschwitz-Birkenau site. However, for many it was the thousands of discarded children’s items that hit home the hardest. Hundreds of thousands of innocent children and babies went into Auschwitz – only 600 permanently scarred youngsters came out. Tears, as they say, are not enough. The fact that Auschwitz remains today as a UNESCO-protected museum is very, very important. While it is there we can all remember the evil that man is capable of and can also have a place to mourn the millions who died purely because of their race, their nationality, their beliefs or their sexuality. And it is perhaps the ultimate irony that when Hitler promised a ‘thousand-year Reich’ the only part of that appalling regime that could still be here in 1,000 years is this tragic place on the Polish border, where the Nazi ideology showed its most hateful colours. May God bless all those that lost their lives in the camps I visited today and others like it. And may we never, ever allow this horror to happen again. Sam, I didn’t make, or notice, any truly personal attacks. Professional, perhaps. I’m surprised you’re happy speaking for the entire local newspaper industry though: “No local paper will ever support one party or another officially as we believe everyone has an equal right to local news.” I certainly think other owners – eg the Scott Trust – would have no problem about openly criticizing the BNP. Which, back to my point, aren’t considered a legitimate party. Which, again, is why you can’t be on the police force and be a member of the BNP. I am aware that there were actually several failed attempts to ban The National Socialist German Workers’ Party, but I am unsure what point you are trying to make Sam, by mentioning it and saying ‘the rest is history’. I clearly said I think you SHOULD discuss the BNP (banning them would only make them heroes in some peoples eyes and make it easier for them to peddle extremism). Indeed, the rest IS history – a completely legal party created the worst human disaster in the history of modern mankind and we should not be blase and assume that cannot happen again – that was my point about it being dangerous to implicitly present them as ‘safe’ in the Chronicle. In what way is that point a ‘double-edged sword’? No, I don’t think you’ll be written about under the headline ‘My local paper’s anti-racist friends’ because it is understood that a letters page has not got the authority of the paper behind it and is individual opinion rather than ‘news’ or reporting. The two are very different forums. In an attempt to finish on a positive point, I would just like to point out how fantastic it is that we are all able to have this debate at all. Important to remember how precious that is and not to get complacent about it by say, printing things in local press which make extremists look accessible and cosy. @ Sam “How could rational, normal people treat others like that, I wondered?” What a wonderful question. Maybe you could slip it in the next time you’re interviewing a representative of a racist, holocaust-denying organisation. @ everyone else: if you have an essay about the Holocaust you’d like to share, please link to it rather than posting it in full in the comments. Otherwise, I think we’re probably safe to assume that everyone agrees the Holocaust was an atrocity and get on with discussing the journalistic ethics of reporting the on BNP. Sorry if you think we’re getting too personal, Sam. That’s not my intention, I assure you. It’s your apparent acceptance of what we see as poor quality content that is the issue. You ask: “how else can I be judged but by very good weekly sales, remarkable web figures on our supposedly p***poor site and a host of national awards”? If I operated the only newspaper-backed website for Bath news then I’d expect to get stellar page hits too! But that doesn’t mean the website isn’t piss-poor, now does it? Has the Chronicle ever received an award that did not come from the Newspaper Society or within Northcliffe? Your piece from Auschwitz does you credit but I have to question your inclusion of it within this discussion. Nobody is suggesting that you personally are racist but that your newspaper’s poor quality journalism has made the BNP appear far more appealing than it ought to. It’s a great shame that you still don’t seem to have even understood the point of discussion. In deference to Sarah I won’t post an account from the late 70s of my hitting Martin Webster on the nose. Ceedee, i am sure everyone else is bored of our award discussion but we won the South West Media Awards weekly paper of the year award last year (a totally independent contest sponsored by EDF energy) and we were shortlisted for the best weekly in the UK by the Press Gazette. We never won a Northcliife award – because they don’t actually do any. Maybe, yes, I was wrong to include my essay on Auschwitz but I was just trying to make a point about the fact that I am a person with my own beliefs and passions a well as an editor that has to look at the bigger picture. I could tell you more if we ever met but I am not going into it online…. I dunno, maybe I was wrong to get involved in this debate at all but trust me I am taking it all in. And, dare i say it – keep up the pressure on people like me guys. Boring as it may be, Sam. I just can’t resist another post. Call me paranoid (and you may well be correct) but the website that organised this “totally independent contest” (paid for by EDF Energy), HoldTheFrontPage, was set up by Northcliffe and later added participation from Newsquest, Trinity Mirror and Johnston Press, wasn’t it? So that’s exactly the same folk that dominate the Newspaper Society? On a tangent, I’m curious as to why comments have been disallowed on today’s follow-up story, “Protest over BNP at meeting” when they were permitted on the original? Getting involved in this discussion was a brave move and continuing with it when we’ve not capitulated even more so. Speaking for myself, the only reason I’m still poking you is that, despite all my criticism, I care about the Chron and want it to improve. It would probably be far better for this discussion to be had within the Chronicle’s website but, apart from your light-hearted blog, there doesn’t seem to be an appropriate space. Maybe you could fix that? Apologies to Sarah for hogging her space! Thanks ceedee for the supportive comments. It’s good to talk. I have learned a lot from this discussion. I will be back again in future if Sarah can cope! To Sam: I would have thought that, like anyone who writes, reads or otherwise consumes the news and also has half a brain (and I’m not saying you don’t, you clearly do) you would be aware that there is no such thing as objective reporting. Whatever you write, you choose an angle, you pick out the facts and quotes to use, it gets a headline and everything else and there are decisions made which, even if there’s no value-judgement involved, affect the way the story is portrayed. You must realise this. And I for one don’t like the angle you’ve taken with this piece. I would like to know, please, where you got the story from. I would like to know if any kind of press officer or press release was involved and, if not, where you got the phrase about the people who are allowed to join, which I can’t even bring myself to re-type. So you went to Auschwitz. You saw the damage that can happen when people believe far right parties are simply supporting their needs and interests and it’s fine to go along with it all. Yet you feel balanced reporting should include the views of a party whose members can be sacked from certain public jobs if their membership becomes known because – why was that again? – oh yes, people think they’re racist and hateful. Or to put it another way: I would like to enquire as to whether the article being uncredited is down to it coming from a press officer or agency of some kind? I am struggling in particular to see why the state of their kitchen table was seen as a relevant inclusion in what you say is an objective, balanced news story. If I was writing or subbing this story I would have lost all the fluffy waffle about family businesses and leaflet-strewn houses. I would have stuck to the facts and left out the colour if this was meant to be news. What I really don’t get though is why there is no explanation of what the BNP is. The picture implies the debate is all about EU rule. The piece does not explain why the BNP is controversial, why people don’t want to let it hire venues… all we know is that they needed people to stand as candidates, that the party has gone from strength to strength and that this nice family who are all standing run a family business and help out special needs kids. My god, some PR person somewhere must have been in tears of joy when they found that one out. Was this taken from a press release? If not, you might like to examine the fact that, while you say you are all for balanced reporting, this just radiates BNP sympathy whether you want it to or not. I get the point – and I am listening. This was not a PR written piece – believe it or not we don’t do that – but the more I read views like this the more challenged I am. And I also take your broader point. I know full well that every thing we write could be written in a different, contrary way and it is a responsibility I take seriously as do all my staff. We do, I assure you, try above all to be impartial and credit our readers with the intelligence to work things out for themselves. It si not our job to preach I don’t think. Ok, it is a difficult balancing act – and I am sure we don’t always get it right. Incidentally I am tempted to go and report on the debate (which includes the BNP) at the BRLSI on Friday. Is it better to be on the inside asking the BNP questions like those raised here or be outside with banners? Or both? I really ought to go to bed…. I think you should be inside, questioning and reporting. If I wasn’t away on Friday night, I’d attend myself. But I’m a blogger and necessarily a part-timer – which is why I’m especially conscious of how important professional reporters are, when they’re doing their job well. (Edited to add) But like Anne, I’m very curious about the genesis of that family profile. Who approached you with it? How was the interview done? Who wrote it? And how did that line of BNP cant get in there? I too am a bit puzzled about why the story appeared in the paper. I was put off by the heading and initially I chose not to read it as the heading said to me ‘here’s a family that supports a particularly distasteful political (is it really?) party’. What news value is there in an article such as this. Who was the target audience? I would think that a reader who knows anything about the party, would either be completely supportive of it or would abhor it. Their views have already been formed. A reader who knows nothing about the party would not learn much about it from the article, certainly not enough factual information to form an opinion about the party, either pro or con. If the reason for supporting the story was to show family togetherness, there must be other families out there who are supporting each other in much more worthy causes. Whether the Chron copied it or the other way round you decide. And since then I’ve seen nothing reported on the election bar a general piece about the number of candidates. So forget the 350 other people contesting seats (all their own human stories) or their policies because in news values what the BNP does is of more merit. Personally, I feel the reaction to the original article is vastly over-the-top. As the editor says, surely the best thing as a local newspaper is to treat the BNP as you would any other political party. After all, the vast majority of readers will know who the BNP are and what they stand for. To lace the copy with emotive and powerful language at best treats readers as if they have no idea what the BNP are. At worst it plays straight into the BNP’s hands, enabling them to play the marginalised card – which they already do to great effect, without any help from the rest of us. The story is written straight and to be honest I think any notion of political bias (or implied acceptance of racism) is completely false and ingenuous to the reporter. The BNP is an emotive subject, but as with anything that raises anger levels (and the BNP thrive off doing that themselves) you have to be prepared to step back and look at it objectively. Let readers make up their own minds. The vast, vast majority will see the BNP for exactly what they are without local newspapers telling them with moral outrage. Fascinating debate. Much kudos to Sam for getting stuck in too. It’s a credit to the internet that it hasn’t descended into farce. There is an increased presence of the BNP in my local area (Sheffield) and I find it sickening personally. The media representation of the party has to be undertaken with a great deal of care, there is a dangerous ideology motivating these people and it would be prudent to spotlight the matter at all opportunities. Crack-on Sarah, your writing is increasingly passionate and lucid – a (nearly) daily joy. Dan, the report unquestioningly uses a phrase to describe the BNP’s membership which is only otherwise used by the BNP itself. That alone is “emotive and powerful”. All I expect is that the newspaper would give an account of what the BNP actually stand for, rather than publishing jolly features about how nice they are. And this blog post, and these comments, are all instances of people doing what you suggest they do and making up their own minds. This piece didn’t treat the BNP the same as any political party: it was run as a family story (see Sam’s comments), so other parties without the same little hook don’t get the same flattering coverage. I wish all parties were treated the same, with substantive analysis of their intentions, but that simply isn’t the sort of political reporting that gets done. Playing into the BNP’s hands would be letting them present themselves as a harmless vessel of nebulous pride. Rejecting the BNP’s beliefs and arguing for better reporting is better than letting them assume universal tacit approval of what they do. Thanks for stopping by. Apart from the fact that this article seems to do precisely what the BNP candidate says he is most interested in doing (ie raise the party’s profile), the most depressing thing in it was the fact that in a quote in the piece about the cancelled meeting, one of the candidates says “It seams like a surreal compromise”. That would tend to support the view that journalists don’t work at the Chronicle any more. Well, sub-editors, anyway. In my view this editor should take a long, hard look at himself. I’m tempted to comment, as a local reporter, but feel it may be pointless. Both sides are right, from their own perspective. Kudos to Sam for answering the accusations. I would argue the story is valid, albeit a little flat. There is nothing inaccurate in it, and the usage of the BNP’s description should really have been in quotes, with it explicitly credited as being taken from the BNP. The story does stipulate the party is “controversial”, which it is in the eyes of right thinking people. I do wonder what’s wrong with the residents of Corsham though – not that he was elected, but no-one had the balls to stand against him. Probably too busy blogging, eh? Sam is also correct about the difference between local and national newspapers and the reason is a mixture of common sense (if the editor comes out in favour of one paper, you’ve just slashed your sales by about three quarters) and old fashioned balance (local papers should criticise and examine every party, not just the ones it doesn’t like). Should every story about the BNP be reduced to a raging challenge to its legitimacy, purely so everyone who hates it can feel happy that the chavs have been told the truth…? Would anybody even read it or just sleepwalk into the “british jobs for british dolescum” line by the BNP (I joke… too much League of Gentlemen in my life). On another thread I mentioned a link to holdthefrontpage.co.uk which reports on Newsquest taking the BNP advertising pound and the justifications by Newsquest editors. Is that the step too far? Pingback: The Socialist Workers’ Party rejects accusations that it is left-wing… « YDUE! Yes, perhaps he should. Certainly, there should have been *some* sense of what the BNP believes in – as it is, the original article and to a lesser extent the Chron revision are veering into propagandist puff pieces about the good works done by BNP members, without peering into what makes them ‘controversial’ in the first place. As to the point that the article is “valid”, that’s deeply questionable. As Tim has pointed out to resounding silence twice already, the BNP can’t really be considered a legitimate party given the fact that serving police officers are barred from BNP membership. Which should answer your question “Should every story about the BNP be reduced to a raging challenge to its legitimacy, purely so everyone who hates it can feel happy that the chavs have been told the truth?” – no, the reason their legitimacy needs to be challenged is that their policies are racist and ignorant, which should be more than enough for a local reporter with an ounce of professionalism. The point is – and really, really *try* to hang to this, because it apparently keep on slipping by – that discussing the BNP without challenging their view, considered by most to be illegitimate, assumes a legitimacy which does not exist. Surely you can see this is a dangerous thing? “Probably too busy blogging, eh?” God knows what Corsham’s like for bloggers. I don’t live there and I’m not a politician by inclination or ability. I couldn’t hack the leafleting, never mind the day-to-day responsibilities. “Should every story about the BNP be reduced to a raging challenge to its legitimacy, purely so everyone who hates it can feel happy that the chavs have been told the truth…?” First up, chav is a word for snobby pricks. Secondly, *I* want to be told the truth. I want a local paper that *I* can rely on for informed news about my area. Not one that mindlessly recycles material from sister titles which are blandly quoting racist politicians. Are serving officers allowed to be members of the Monster Raving Loony Party? Meanwhile, some people would argue that Conservative policies are cruel to the poor… should we then reduce EVERY article to a challenge about their devisive and less-than-humane treatment of those less well off. Others would say Labour are purely about taking away people’s individuality for the good of the state… should we rage at them on EVERY article about their crushing of the individual spirit? I’m not saying the BNP are nice people. And from what I’ve read of the Bath paper, neither were they. But what do we want – a swathe of partisan local papers or – loathesome as it may appear – local papers which will allow all officially recognised political parties (yes, even the Liberal Democrats) – a platform to voice their opinions? And allow the opportunities for the PUBLIC (yes, and that means the public getting off their arses, or bloggers leaving their computers) to go to meetings and challenge those same political parties, to join up to their chosen party, perhaps even to go campaigning. Not to go, “I don’t like what you represent, so I’ll sit here and criticise the local paper”. Yes. The BNP should be challenged on its policies – as it is an electorially recognised party. As should the Tories, Labour, Lib Dems, Monster Raving, Respect and the lot who think they can levitate by meditation. You’re saying that should happen on every single article without exception and mainly, if not only, with the BNP. That’s where blogs come in. And public meetings if you like popping down to the local church hall. Or AntiNaziLeague marches in opposition to BNP marches if you’re feeling very energentic and like a ruck. I AM saying that if you don’t like the party, then join the fray, go campaigning, help Searchlight, join the AntiNazi League, go to a Get Cape Wear Cape Fly gig. Don’t just blame the local paper for reporting the facts. They (the BNP) exist, they have their opinion, they often have seemingly innocuous representatives who sincerely believe their party is actually pretty okay. It does seem that some bloggers – no names – would love to see every local and national paper in the land to either sing from their songsheet or else be crushed into oblivion. Which, pardon me for standing up for already put upon local newspapers, would be a shame. Ta for listening, must go now to get milk and teabags. Wonderfully vivid blog post and spirited debate in the comments. It does reflect well on Sam that she chose to get involved, even if the issues have not been resolved. I’m slightly surprised to hear that there are local papers who don’t use PR news pieces verbatim though. During the time I spent working in PR (although not politics), I usually had a 100% success rate in placing articles in British local papers. My understanding was that, editorially, it was considered a necessary evil in these impoverished times. Evidently I am misinformed, or practice has changed since then, or the Bath Chronicle is in a minority. You didn’t actually answer the “should every story… ” question, but I do understand where you’re coming from Sarah. I agree, I’d also like a local paper I can rely on, so I can make informed choices. But I’d not be making an informed choice if that paper set about being overtly partisan, criticising one party singularly at every opportunity to the exception of all others. That’s just hate, that’s not journlism. Now if the paper arranged for a debate, interviewed each candidate (perhaps do it live on their website) and took the fight to them on every policy, THAT I’d love to see across the UK, particularly where every BNP candidate is standing. But effectively writing, “your all a bunch of racists” on every article which mentions them… I wouldn’t respect the paper that did that. There’s no intelligence, no finesse, no crushing blow. That’s just a playground approach and won’t work to show these people up for what they are. BTW, was there anything the candidate in the article said which was clearly and overtly racist? Seriously, I’m so blind I missed it. BTW 2 – As for Chav… I know what *my* version of “chav” is, but I don’t know what your interpretation is. To me a chav is an ignorant hate-filled scumbag who relishes in it. Wealth, position, title is all irrelevant to me. If you really want to go down the Julie Birchill road of squeekery on how noble the Chav is and how unfairly put upon by the middle classes purely because they don’t like such honest to goodness working class youngsters then I’m going home in despair. I’m from working class east london to south Essex stock (god, that sounds like I’m cattle) so it’s fair to say that some of my best friends, worst enemies and parents are working class. Yay for the workers and people who talk rough as old ginger. For the record, I only use the shorthand of “chav” because “heartless, thieving gutteral and violent cunts who beat up small children, old people and anyone else they can” is such long word that I can’t be arsed. And yes, I have met them in their own homes and spoken to them at length, not driven by them in my taxi on the way to a trendy wine bar. And *wearily* yes, I do have love in my heart for my fellow man. Top blogsite, by the way. Cheers and peace. A commendable debate on a difficult subject. The Chron doesn’t have any Wiltshire reporters because it hasn’t been given the budget for them. This kind of reporting is the result. Since the Western Daily editorial team has been similarly defenestrated the situation in that county is unlikely to improve. So, bloggers could be stepping in to fill the gap and this thread might be an example of the kind of local analysis we could be providing. Carl wonders “are serving officers allowed to be members of the Monster Raving Loony Party?” It’s a lazy and glib attempt at making a point, because the answer is, of course, yes. As far as I’m aware the Monster Raving Loony Party’s main aim – if indeed it truly has any – is to satirise the pomposity of politics. So my question to you is why do the police force feel comfortable with explicitly rejecting the policies outlined above – which let’s be clear about this are unequivocally racists – but the Bath Chronicle apparently doesn’t? Yes, I think every story about every political party should make an effort to deal with their policies. Especially when their defining policy is racism. Racist (rightly) is a pejorative word, and I believe the BNP prefer not to be associated with it, but it’s the only accurate description of a party whose policies are based on applying rights according to ethnicity. It’s not partisan to discuss policies or to criticise policies. It is fatally partisan to use the language of the politician you’re reporting on as editorial. The lack of quote marks around “white ethnic indigenous Britains” is a huge lapse in editorial judgment in a piece that looks pretty ropey in principle anyway, and I don’t see any way of defending it. It reads like PR fluff. If I picked it up from a wire I would expect to do a lot of extra reporting and if I had that story in from a reporter (I’m a freelance writer/editor/sub) I would send it back. By the way Sam, I think you should apply your argument to all political parties. In this country there’s a bizarre loophole that means if you can prove you have some political agenda, you can register as a political party – and send direct mails through the post. For free. Which is how come we have (or at least we did a few years ago when I spent a summer temping for an electoral registration unit) the Witchery Tour Party and the Pink Elephant Party (whose logo has to be white to comply with ballot paper regulations). These, too, are legal political parties, so will you be giving space to them? As you want to give space to all legal parties, right? So why the BNP and not the Pink Elephant Party? I’ve said it before and I’ll say it again: if it was meant to be a balanced article it should have explained WHY the BNP has problems booking venues etc and not just implied they are victims of some kind. And I agree with Sarah: the article should not have used BNPspeak. “It is fatally partisan to use the language of the politician you’re reporting on as editorial.” Exactly. Like Sarah says, this phrase should have been in quotes. Some truly great comments here that have really made me stop and think. To be honest you are somewhat pushing at an open door on a personal level (if any of you actually knew me you would know exactly why I said that) but I have had to look at this from a professional perspective as well. ‘The party, who were in power in the Soviet Union when Stalin killed millions of people in horrific circumstances and who were also the ruling elite which conducted the evil Cultural Revolution in Maoist China….are fighting to win a seat on Bath council’. Perhaps we should do that – but do you get the point? And isn’t the above subjective anyway (although frankly I would love to hear a defence of Stalin or Mao!)? I don’t have the luxury as a local regional newspaper editor of being able to preach and pontificate in this way – it is just not what we do. I just have to report what is happening locally as fairly and without bias as possible. And as for the often repated criticism why did we use the ‘white non-indiginious’ line it is precisely because that is what the BNP says. Groups like that are forever saying they are misinterpreted and play the ‘media hates us’ card. By quoting them direct it shows them up for what they really are because they said it, not us. No misquoting, no out of context remarks – their words. And they are damned by them far more than by us putting a spin which they could instantly deny…. Anyway….I am probably going to report on the Bath meeting tonight for all EU candidates where I think the BNP will be present. I will do my best to put them on the spot – if the protestors let me through that is! 1. If you’re quoting someone, you put their words in quotes and attribute them. Otherwise the paper ends up placing its own authority behind some very dubious statements, like this one. I assumed that was a basic principle of subbing – it certainly has been in all the publishing environments I’ve worked in. 2. It’s not the local paper’s job – or any paper’s job – to represent individuals, organisations and political parties according to their own self-image. That’s what press releases and official websites are for. If I’m spending money on a newspaper, it should be putting some analysis and investigative muscle into the issues it’s reporting. 3. The BNP’s racial policy is part of the manifesto these candidates are running on, rather than the historical background of their politics, so asking a BNP candidate about their beliefs isn’t really analogous to asking a Marxist to comment on the purges. That said, I do think that questioning along that line is valid and useful. I’d be interested to know how communist party members reconcile themselves to the history of their ideology. Like Annabel (who said this up there, somewhere), I think local newspapers are an essential democratic resource. You should be scrutinising all the claims that come your way – and I know that when your resources mean you’re accepting recycled copy from sister papers, that might be asking for more than you’re set up to do. But you should aim high at least. I agree with everything Sarah says above, including the first part – Sam, thank you for engaging with this debate. I have just returned form the meeting in Bath where the BNP were there and there was fantastic turnout from people against them. And yes I will be doing a report myself.. Does everyone have the weekend off?! Somewhat inspired by this exchange I decided I would report on last night ‘s meeting and protest myself for the Chronicle, our website and probably our sister paper the Western Daily Press as well. Here is my report on last night’s demo and meeting where I have tried to give everyone a say as I have said I am committed to do. I also think it proves a lot of what I said – let the BNP speak and they may well be condemned by their own mouth. I went into the meeting after the protest and stand-off and heard the BNP speaker utter the incredible quote I have printed below where he referred to ‘Negroes’. What is this, the American civil war? It was a fascinating night where the debate outside and inside the buidling was as electric, controversial and complex as this one. Thanks Sam – nice report, and I do appreciate seeing quote marks in the right places. Was the meeting itself totally scuppered by absences? It’s rather strange to realise that the BNP candidate hasn’t understood that putting “British people first and foremost” is itself a ‘racialist’ viewpoint. So it’s hardly surprising that he believes that his party’s manifesto isn’t racist! Thanks for a great report, Sam. Hope we’ll see more in the future. I’m a little disappointed you haven’t answered my question about giving space to one legal party vs. another. You might perhaps want to point out that it is possible to be “Negroe” or “Muslim” and also be British. Because without such mitigating comment, use of this quote implies that only white people can be British. I am afraid you just don’t get what independent, impartial journalism is all about. I have said throughout this thread that in a news story (not a comment one) in the regional press journalists should be as impartial as possible and let the readers make up their own mind. That quote was said by the BNP and there was nothing I could (or should) have added to – in my opinion the man was condemned out of his own mouth. You see it, I saw, it, I think readers will see it. If I had qualified it then I could have been accused of spin or proganda – that is NOT MY JOB. And if people thought that I was spinning the story I would lose all my credibility as a journalist and peopel wouldn’t believe any element of the story. Taking further, should I have also have ‘qualified’ what the Bath Activist Network, the Labour MEP, the Lib Dem, guy, the Green canddiate or the English Democrat one said as well? Our job in a news story is to report what is said and let the readers make their own mind up. Don’t understimate the intelligence of our readers. Sarah, amazing work you have done here. This is the sort of journalism we need. Unfortunately all the really great writers and thinkers like yourself are not hired in mainstream/local media. And ‘fair and balanced’ usually means not upsetting the powers-that-be or the racists. With regards to treating the BNP in a ‘fair and balanced way’ – they are a party of extremists who would not treat non-whites, LGBT people, trade unionists, lefties, travellers etc etc etc in a ‘fair and balanced way’ if they got a whiff of power (to say the very least) so why should they be treated ‘fairly’? And let’s be honest, ‘fairly’ here translates to ‘dishonestly’. I simply could not believe that fluffy piece written about them – sickening stuff. And I for one will never ‘defend to the death’ a fascist’s ‘right’ to promote hatred and violence towards minority groups. No way. Thank you Sarah – please keep it up! We don’t. We do however seriously question the intelligence of some in the media. And that’s quite a concern when it results in fascist rhetoric being regurgitated unquestioningly, and a family of racists being portrayed as The Waltons. ALL the really great writers and thinkers????? I think there are plenty of great journalists in this country if you bother to look for them and as for the media not ‘upsetting the powers that be’ then I suppose that does not include the supposedly establishment Daily Telegraph then who have basically bought Parliament to its knees? Sure, they paid for the privilege but that was money well spent in my eyes and they did us all a great favour. And trust me this is where the media has truly hurt the ‘powers that be’ and shown the vital role for democracy the press plays in this country. And OK, you didn’t like the first BNP piece – that is your choice and I understand why you say that. But to say papers don’t wnat to upset the racists is ridiculous. Have you READ any of the national papers lately? A strong anti-BNP consensus is growing in papers of the left, right and centre – perhaps you have chosen not to see that? We are not all bad mate. Honest. I think this one is done. Comments closed now, unless I get a super-compelling reason to re-open them. MC, thanks for the kind words but it’s only fair to point out that I’ve never applied for a newsroom job.